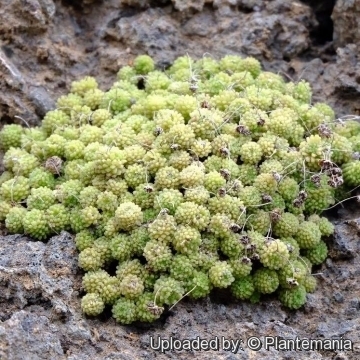 Petrophyes polyphyllum (Haw.) Webb & Berthel. Accepted Scientific Name: Monanthes polyphylla Haw. Origin and Habitat: Monanthes polyphylla (subsp. 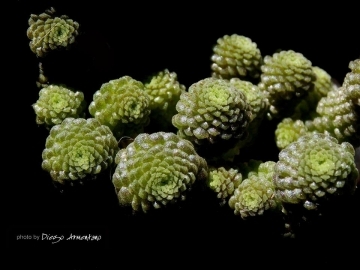 polyphylla) is native of the Canary Islands, and grows on the islands of Gran Canaria, Tenerife and possibly La Palma. The subsp. amydros is endemic of the island of Gomera and possibly of La Palma. Altitude range 100-1500 metres above sea level, but usually found at relatively high altitudes. Habitat: In nature it grows very localized in crevices on shaded earthy cliffs and damp rocks. 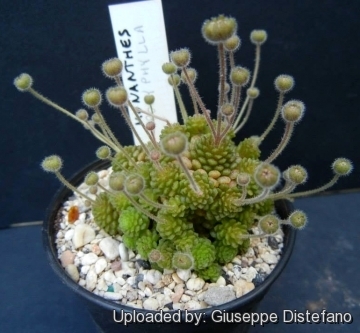 Description: Monanthes polyphylla (so named by Mr Haworth because it present but one flower at a time) is a charming tufted succulent, up to 12 cm tall, with tiny many-leaved rosettes, forming soft, shiny, dense clumps which in June bear numerous small purplish flowers like parasols. 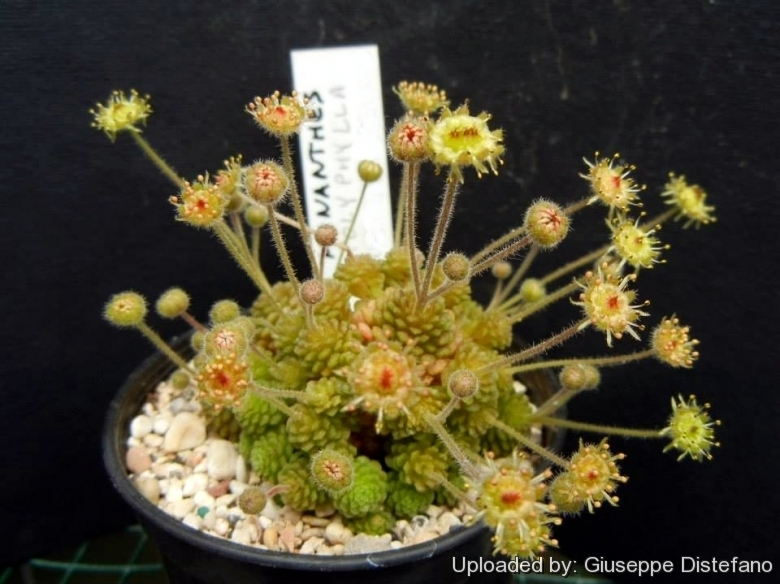 It was the first known of the genus Monanthes, and is still the most attractive in this genus. Similar species: Resemblances with the Monanthes subcrassicaulis and the Monanthes pallens var. silensis are remarkable. Habit: It is a richly branched perennial succulent plant characterized by its distinctly creeping habit that forms dense cushions of many almost equally large rosettes, on slender creeping stems. Stems: Procumbent, wiry, 1 to 2 mm in diameter. Rosettes: Minuscule, very dense, hemispherical to shortly cylindrical in side view 6-14(-20) in diameter, mostly pinkish-grey. In cultivation Monanthes polyphylla often loses this characteristic tinge, and remains green or purplish. Leaves: Tiny, soft and succulent, narrow obovate, cylindrical or club-shaped, rounded or truncated and crowded in a rosulate manner with entire margins and light green in colour. Lamina 3-6 mm long, 1-2 mm wide and about 1 mm thick. Lower surface often with few short glandular hairs. Tip densely papillose. Inflorescences (racemes): Terminal, unbranched or branched from its base. Pedicels densely glandular-hairy 10 to 20 mm long generally 1 flowered. Flowers: Small, stellate, purplish, 4 to 9 mm in diameter. Calyx densely hairy. Petals 6 to 9, narrow elongated, pointed or tapered 3.1-4.2 mm long and 0.4-0.6 mm wide hardly longer than the calyx scales of flower. Petals margins with glandular hairs. Blooming season: From end of May until end of June. Monanthes polyphylla subs. amydos (Svent.) Nyffeler: has a more compact habit with prostrate shoots 2-3 mm Ø, cylindrical rosettes 8-14 mm Ø, leaves 4-7 mm long, 2-4 mm wide, 2 mm thick. Distribution: Gomera and La Palma islands. 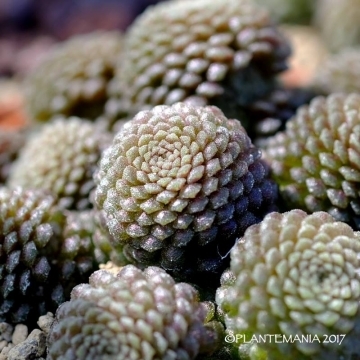 Cultivation and Propagation: Monanthes polyphylla is one of the more common species in cultivation, that takes very little place in the collection and is asking very little attention. The only demand is a very poor substrate, little water and a mid-shade place. The only things that can kill this plant are cold, hot blasting sun and overwatering. The flowers are jewel-like but not often seen, especially when the plant is grown in shade where it seems to do best. Nevertheless, it is appropriate to provide adequate growing conditions in order to obtain compact plant with many flowers. Exposure Suited for bright situations in mid-shade or under filtered sun. They are often grown under the bench in the shade house along with shade-tolerant haworthias, but if kept too dark they may become overly lush and greener and could be prone to rotting due to over watering. Strong but filtered light encourages flowering, but they likely to suffer from sun scorch and often die if over exposed to direct sunlight during the hottest part of the day in summer. Avoid mid day sun in summer! Soils: Use a an open and free draining mineral compost with little organic matter (peat, humus) that allows therefore roots to breath (as it is rot prone). Outdoors a well-draining rocky or sandy soil is ideal. Repotting: Repot it every 2 or 3 years in order to evaluate the health of the plant and provide a larger growing space being careful not to damage the sensitive roots. Watering: It likes a winter's rest and should be kept dry during the winter months. From early spring onwards the plant will begin to grow and watering should be increased gradually until late spring when the plant should be in full growth. Water regularly during the aestival growth cycle so long as the plant pot is allowed to drain and not sit in a tray of water (this plant need plenty of water) But needs to be avoided wetting the bodies of these plants while they are in sunlight. A wet plant in the sun light can cause sun burning which can lead to scars or even fungal infections and death. From late summer watering should be reduced to force the plant to go in to a state of semi dormancy, by autumn you should be back in to the winter watering regime. Keep dry with ample airflow in winter (but for outdoors cultivation it is somewhat resistant to wet conditions, too if grown in very draining substrata). In the rest period no high atmospheric humidity!! Care must be taken with watering as they tends to become swollen and untidy in growth habit if given too much water and shade. Uses: It is an excellent plant for container growing. It always looks good and stays small. It look fine in a cold greenhouse and frame. It do well outdoors in rock gardens and terraces as well. The slowly creeping stems cluster freely to form mats as a small area ground cover. Monanthes also makes an excellent potted windowsill plant. - Mealy bugs: Mealy bugs occasionally develop aerial into the new growth among the leaves with disfiguring results, but the worst types develop underground on the roots and are invisible except by their effects. Eliminate mealybug infestations by dabbing the critters with cotton swabs dipped in alcohol or by soaking the succulent roots in a systemic insecticide. - Rot: This species is relatively easy and accommodating, seldom suffer of cryptogamic diseases, but is occasionally infected by Helminthosporium, Pythium and Fusarium if kept too moist. Rot it is only a minor problem with Monanthes if the plants are watered and “aired” correctly. If they are not, fungicides won't help all that much. Propagation: It is easy to propagate either through rosette cuttings or seed. Seed germinate in 14-21 days at 21°C. Sow in a well drained medium.